Don't you love those free gifts that end up costing you money? I was visiting my parents again this past weekend and continued some of my clean-up and organizing efforts for my dad (who is doing ok with his treatments so far). One thing he'd wanted me to do was set up a new printer he'd bought. My dad is such a weird collector-- he gets obsessed with certain things. (Like I should talk, given what I just wrote about pens.) A few years ago, he bought his first printer, a very nifty combination printer/fax/scanner which was amazingly cheap. Then a year or two ago, he bought a new printer. I don't think the first one was broken-- I think he must have just read an article in Consumer Reports recommending the newer model, or the prices on printers had gotten even more incredibly cheap and he thought he should stock up, or something. Anyway, he set up the new printer, but almost immediately, it didn't work quite right-- the black ink never printed properly, only the colors. On one of my visits before he got sick I tried to play around with it, but I couldn't figure out what was wrong. Dad procrastinated about returning it and eventually bought a new printer, which he hadn't gotten around to setting up when he got sick. I was still using the malfunctioning one when I was trying to set up his budget and print out information about wills, etc. My work-around was to make the font color on everything purple rather than black! On this latest visit, I finally set up the newest printer for him. The other two old printers were still sitting there waiting to be disposed of and it occurred to me that although I don't need a printer at home, I could use a scanner, and that part of the printer seemed to work fine. So I asked him if I could have the old printer-- you'd think I wouldn't bother to ask, since it would just be thrown away, but my dad tends not to throw anything away, especially out of date electronics. He still has a dusty old reel-to-reel tape deck in the basement. Sure, you could have bought a new printer, but reclaiming one is morally superior. I suppose you can take comfort in knowing that there is one less functional printer in a landfill now. Refilling ink printers is one of the biggest scams on the planet. They have stores dedicated to them. Places like HP and all the other manufacturers know they have you when you buy one of their printers. They make little (still some) margin on the printers, however, they get you on the maintenance. The spare parts. I had a great printer - a all-in-one HP ink jet I got for 100 bucks. The color cartridges would last maybe two printings because I only printed in color only like once a year. The black was fine - because I printed a little more frequently. It was 45 dollars to replace both cartridges, at one of the discount places. I said screw it. I gave it to my sister who needed a new printer after her latest flood in her basement (she has had 3). I bought a laser printer - and the cartridge can be re-filled manually. So all I need to do is buy toner - and put it in. Toner is like $5 for 1 pound at the local ink store in bulk. That will last me (according to the printer) almost 25,000 pages. More than enough for me for many years. Being in computers - the trap you are talking about (in general - getting something free - but having to repair it) is typical. My work just gave me a free PC. It was 3 years old, and it was just written off the books. It was fully decked out as this PC was used to do a lot of tasks. I got it and realized it could use more RAM, and maybe a bigger hard drive (since it had 2 already). Then I realized - I don't need all that - and gave it to my son to play with. He won't care if he can get 25% speed out of it. Even if you had bought a new printer, you would have had to biu the cables. They never come with the printer. Madam X -- don't beat yourself up. Even if you'd bought the new printer, you would have had the additional expense of the printer cable since they are always sold separately these days. And the ink cartridges that come packaged with new printers? They're just demo cartridges with no more than 1/2 the ink of a full cartridge. The bigger issue you might face is finding the necessary printer driver for your computer. A similar thing happened to me this weekend. I got a coupon for a free meal at SuperSalad so I took them up on it. The drink wasn't included but that was fine (I brought my own water). It was a buffet so I assumed there wouldn't even be a tip. Not so! They had waiters and waitresses bringing me water, napkins, bussing the plates, asking me how my meal was. It was nice service but then I had no choice but to leave a tip. I'm no scrooge. Frankly I see no need for waitstaff in a buffet place, but whatever. 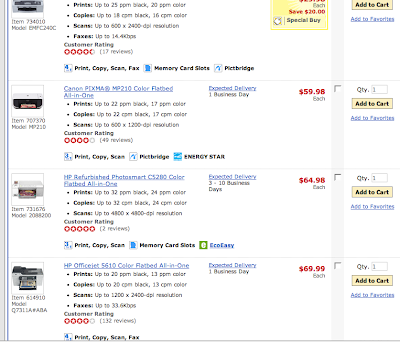 Laser printers are a better deal. Sure, you don't get colour. But you get printing that doesn't smear if a drop of water falls on it. I love my Samsung laser printer. It's on toner refill #3 (it came with a "mini" one) and it's now 5 years old. WOW I surprised that you paid retail for the cables and ink. The best bet is to search online for the cables, you can usually find them for much cheaper. Same thing with the ink, you can find non OEM ink for much cheaper in most cases like 1/2 the price. A few years ago, my brother bought a cheap printer that came with ink cartridges. When the ink ran out, he went to buy new cartridges and found that it would be cheaper to buy a new printer (with ink included) than to buy new ink cartridges! My mom always told me when I was little, nothing in this world is free, there is always a catch. Yet, i still continue to fall for such antics. Printers are quite the money grubbers especially if you use them a lot, that's why most people print things at their job for their own personal use! We print a lot at home．So my husband buys the ink and cartridges on Ebay. Also he resell the used cartridges on Ebay too (We have 3 printers and I guess it's the laser cartridge). Not sure what the buyer use it for but there is a market. we have a office depot membership card and they often mail some useful/useless coupons. We always use the coupon to buy 11x8.5 paper. Don't feel bad. Like the other reader said, when you buy that new printer, they don't fill up the ink cartridge. You just get 1/4 of the use out of cartridge then you have to pay the $60 dollars anyway. What a scam and most people don't know this. So you actually saved money! Tash is absolutely right: there's one fewer printer in a landfill. So it's not that bad.